Directions HOW TO USE: Hold can upright; spray 10-12 inches from hair. Repeat if necessary. AVOID CONTACT WITH EYES. PROFESSIONAL STYLING TIPS: For shaping, spray in desired area; shape or comb hair before spray dries. For volumizing, spray on underside of hair with head down. For finishing, spray evenly over finished style. 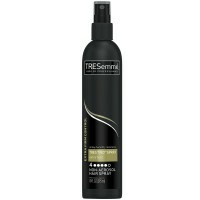 Create salon styles with TRESemme styling products. Uses Professional formula: Completely water-free for superior hold. Humidity resistant. Ultra fine mist for easy, all over, flexible hold. Professional results: Never stiff or sticky. Fast drying mist for instant hold. Long-lasting natural feeling hold. This product contains a maximum of 55% VOC's. This product has not been tested on animals.